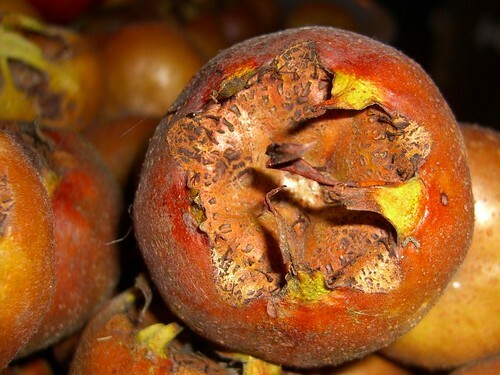 Take medlars, ripe, soft and bright and wash them. Then cut into pieces, removing any bruised or damaged parts. Put the fruit with just enough water to cover them without floating into a large pan and simmer slowly until they become a glorious pulp. Set up a jelly bag and pour the pulp and cooking water into it. Leave until all the juice has dripped through. Don’t squeeze. For each pint of liquor add 12 - 16 ozs of sugar plus a tablespoon of lemon juice per pint. Make sure all the sugar dissolves and bring gently to the boil. Boil rapidly till the setting point is reached. When a teaspoonful dropped on a cold plate wrinkles as you push a finger across it, take the pan off of the heat and quickly pot up into beautifully clean warmed jars. Close while hot. 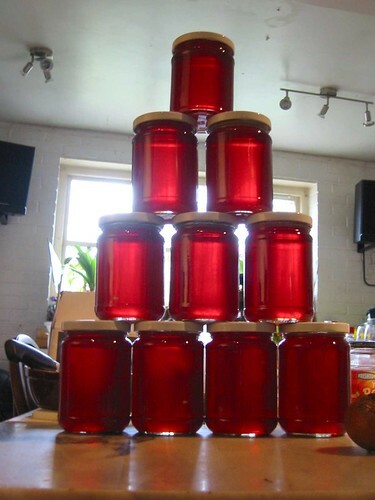 If liked set the jelly in small straight sided moulds and serve as a very sweetly rich pudding. These fruit came from the “Nottingham” medlar in the garden at Newport Pagnell. There are wild medlars in the hedges in France, fruit much smaller but bearing heavily in this excellent fruit year. It is said that the flavour of the variety Nottingham is only average. It will be interesting to compare this jelly with jelly made from the wild bushes. This has been quite a popular entry so I though people might like to know how the batch looked when it was finished. Not quite as clear as last year's (remember what I said about not squeezing the jelly bag) and for a horrible moment I thought it wasn't going to set after I'd put it in the jars, but everything turned out fine. Last year's jelly stored well and is still tasty and spreadable now but the beautiful clearness has turned to an unappetising murky brown so I recommend you don't make too much of this and give a lot away as presents. Have now made the jelly for this year and I was particularly careful not to crush the fruit even while it was still in the pan. With a very fine jelly bag this gave an extremely clear juice but I think it may have reduced the overall pectin content because this time I did have to reboil it. I was in a bad mood and a hurry, gave it only 20 minutes of serious boil, poured it into pots and hoped for the best but the next day it was as runny as a runny thing. So there wasn't much else I could do but tip it back into the pan and boil it up again. After ten minutes more boiling it was setting, almost too well and is back in its pots looking ruby clear and glorious. Labels: medlars jellymaking "beautiful fruit"
I found your blog through a search for Medlar Jelly!!!!!! I have just been given some. But enjoyed having a read through some of your posts! Those mushrooms look scrummy!!!! !